Most Christians, and even non Christians have been taught that Christmas time, December 25th is the celebration of the birth of our Lord and Savior Jesus Christ. This teaching will help break down scripture and document the true date of Christ’s birth. It will also point out to you where the date of December 25th came from, and how this date is also significant. Why is December 25th significant still? Because it is actually the conception date of Jesus Christ. One thing that let’s us know that Christ was not born on December 25th is that there were shepherd’s in the field still at the time of His birth. Shepherd’s do not have their flocks out in the middle of winter. Having that said let’s document that December the 25th was Christ’s conception. We are going to start in Luke with Zacharias. For those who don’t remember, Zacharias was a priest who had a course twice a year to work in the temple. This is where you must start and learn when the course he served was. It was the course of Abia. The dates of this course are June 13th-19th on our calendar. With that being said, let’s look at the 1st chapter of Luke. Zacharias was a Levitical priest, and in order to be married to a Levitical priest, a woman must be a full blood Levite as well. Elisabeth was the daughter of a Levitical priest of the lineage of Aaron, and married this priest Zacharias. This is why God would use them to bring about the message that would show the dates regarding the birth of the coming Messiah, and His true genealogy. Both Zacharias and Elisabeth met all the legal requirements of the priesthood and kept all the commandments and Levitical laws. Elisabeth was past the age of child bearing at this time. Becoming pregnant with John the Baptist later in this chapter is a key event, and an absolute miracle from our heavenly Father. So these verses are letting you know where Zacharias was, and what he was doing during the time that his vision will take place. He was faithfully executing his duties as priest. At the time, this was a very sacred event. The people who were waiting outside the temple were there to see the smoke from the incense which was symbolic of the repentance of sins and indication that their prayers had been heard by our heavenly Father. This angel, Gabriel, as we will find out in a few more verses is a messenger of God, and is here to tell Zacharias that Elisabeth will bear a son named John. The name John in Hebrew means, “Yah’s Gift” which is exactly what John will be, seeing as Elisabeth and Zacharias are both past child bearing years. He will be a great prophet, and will lead many to the Lord. He is a forerunner to Christ, and as you see in verse 15 he will be filled with the Holy Spirit while still in his mother’s womb. Very important considering most teach nowadays that a baby is not even a human being until it’s physically born, which is why abortion is being promoted. We will touch on this a little more later. Zacharias questioned the angel Gabriel, and wanted a sign that these things would take place. Zacharias was shocked by this news, even though the message was coming directly from God. He lacked faith, and doubted the words of Gabriel because he knew that him and Elisabeth were stricken in years. Gabriel was not very happy with the response from Zacharias, so he would give him a sign alright. Zacharias would now be unable to speak until the birth of his son, John. This would be very difficult for Zacharias seeing as his very profession as a priest required him to speak. So, in this verse we see that Zacharias has completed his second course which would have ended at sunset on a Friday. That would make this the sabbath, therefore he would not be able to travel back home that night. He would then make the trip home on the following day and it would take a few days for him to travel back home from Jerusalem. So we know it took a few days for Zacharias to travel back home, so this would bring Elisabeth’s conception day to be on or around the 24th of June. Once she conceived she would go into seclusion for 5 months, thus bringing us to the date of November 24th. It was considered a reproach when a woman could not conceive a child. Zacharias and Elisabeth had been praying for a child for many years, and Father had answered their prayers. Father always has a perfect time for everything, and His plans are better than our own. Just as John’s name states, he is a gift from God, and has an amazing destiny! So this will now put us at December 24th as it is 6 months from the conception of John. Remember that the Israelite days starts at sundown the day prior rather than midnight, and run to sundown the next day. Gabriel was sent from God to Nazareth, of Galilee to the house of Mary. This visit was to inform Mary that she had been selected, special, a virgin to conceive and bear the coming Messiah. So it would be on December 25th (sundown of the 24th) that the Spirit would come and dwell with mankind. Our Lord Jesus Christ would be conceived!!!! These verses are prophecy being fulfilled. God’s word foretold this event in the verse we used to start this very teaching, Isaiah 7:14 “Therefore the Lord himself shall give you a sign; Behold, a virgin shall conceive, and bear a son, and shall call his name Immanuel.” Immanuel meaning “God with us” which is precisely what is taking place at the moment of His conception. God came to dwell with mankind at that very moment! Gabriel tells Mary that His name will be Jesus meaning “YHVH’s Salvation.” Can you imagine how Mary must be feeling? Gabriel is telling this young girl that God chose her to give birth to the Savior of the world!!! 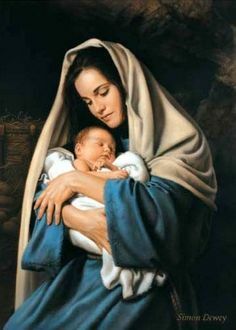 Her son would be the King of Kings and Lord of Lords since he would be from the line of Judah and Levi. It’s important to know that Mary was not doubting Gabriel as Zacharias did when he approached him about Elisabeth conceiving. Mary is simply confused as to how this would take place being that she is young and has never known a man. Gabriel explains to her that God’s Holy Spirit will come upon her, and she will conceive. With God ALL things are possible, and he points this out to her by also telling her that her cousin Elisabeth who was barren has also conceived a child and is 6 months pregnant. Mary shows that she has full faith in the Lord, and wants the will of our Father. She is more than willing to be used by our heavenly Father according to His purpose. This very same day that Gabriel came to her, she went to go see her cousin Elisabeth. She greeted her cousin, and in that same instant, John, lept in Elisabeth’s womb and was filled with the Holy Spirit! This is a very important verse, especially concerning when a person is considered an actual human being. This shows at conception the spirit and soul of a person enter the baby! Many who are supportive of abortion and think that a baby is not a human being if it’s still in the womb have their proof now. Life begins at conception, period! So why don’t more people know this since scripture points it out so clearly? Well, that’s because Satan’s children, the Kenite’s, have infiltrated our churches, and have set up the four hidden dynasties to deceive many so that the whole world would worship the false Christ (Satan) when he returns at the 6th trump! The Kenite’s have used the educational and religious dynasties to school ministers with their father’s (Satan’s) doctrine instead of the true word of God! Remember their goal is to deceive the WHOLE WORLD! They want to keep people caught up in the traditions of men. Most people are so worried about getting their houses decorated and buying gifts to the point where they put a strain on their family and their bank account. They have made this the focus instead of Christ. They also don’t take the time to get into God’s word on their own. Father reveals His truth to those He knows take the time to truly study. He wants our love, and we show Him that we love Him when we spend personal time with Him in His word. I pray that this teaching opens the eyes and ears of those who are meant to see and hear God’s beautiful truth. These teachings are not meant to replace your time in God’s word. It’s important to always study God’s word on your own. Put your trust in no man, only in the Father!